10 Best Baby Monitors: Which You Should Choose? There is a vast array of baby monitors to choose from. Check out this article to make sure you’re getting the best. When you’re expecting a new baby, everything centers around being prepared. For many people, part of that preparation involves buying a baby monitor. Baby monitors can give you peace of mind and make it easier to care for your little bundle of joy. But, with all the options available to the consumer today, how do you find the best baby monitor? Below we’ll explore our ten favorite baby monitors on the market today to help you make a solid choice. Plus, at the end of the article, you’ll find a short buyer’s guide to help you make the most of your shopping experience. But, before we dive in, we want to tell you a little more about our ratings. Babies are well-known for bringing out the most protective side of moms and dads alike. And we know, that when it comes to buying things for your new addition, you want the best. That’s why we carefully crafted this list. Each of the baby monitors on our list below has a rating out of five stars. Monitors with the best scores are at the top of the list, but all of them are valuable. All of them will provide you with an easy way to keep track of your baby and put your mind at ease. To score each baby monitor on our list, we carefully examined what features it offers, how much it costs, and how reliable it is. We also scoured through dozens of customer reviews to find out how well these products work in the long run. Keep in mind; there is a vast array of baby monitor types on the market today. Some of them are incredible technology focused while others are straightforward in design. What works best for one parent may not be best for you. 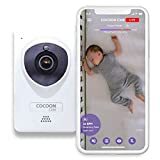 This tech-forward baby monitor from Cocoon Cam offers parents peace of mind and the simplicity of smartphone technology. This monitor has an impressive array of features and is more straightforward than many traditional style monitors. Plus, this baby monitoring system is validated by the top pediatricians at Stanford. The Cocoon Cam Plus comes with the backing of several well-known awards. 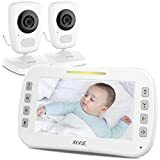 Its features focus on what parents are looking for in a baby monitor and go above and beyond the function of traditional monitors. Plus, it’s easy to use with a simple smartphone app. Parents love the reliability of this product, and the vast array of features it has. And while it is relatively pricey, features such as wireless breath monitoring, 2-way audio communication, and automatic night vision make this product worth the cost. We highly recommend this product and give it an impressive five stars. If you’re looking for a high-quality video-enabled monitor that will grow with your child and doesn’t require a smartphone, this product is an excellent choice. The DXR-8 from Infant Optics features a unique interchangeable lens system that allows parents an opportunity in what view they want of their baby. Plus, this system can be used with multiple cameras. Parents love that this comprehensive system provides delay-free audio and video feedback without the use of an internet connection. Plus, the remote control panning makes it easy to see the entire room your baby is in. This monitor also includes infrared night vision and two-way talk. In addition to the impressive camera, this monitor system also features a useful audio-only mode. It can monitor the temperature of your child’s room and also has sound activated LED lights. It’s worth noting that some users notice inconsistent signal and weak battery life. All in all, this monitor is an excellent choice for many. We give it five stars. This “Smart” baby monitor from Nanit is another one that works in conjunction with a smartphone app. 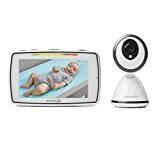 The camera included with this system provides parents with a high-quality view of their baby and employs a simple pinch-to-zoom functionality. This monitor is a high-tech solution to keeping your peace of mind. Parents enjoy the vast array of functions that the app for this monitor comes with. Plus, the camera included provides an impressive picture both during the day and at night. Reviews for this product are overwhelmingly positive. However, some users report too many connectivity issues. All in all, this product is incredibly useful for parents that are smartphone savvy. However, if your internet connection isn’t the best, this monitor won’t work well for you. All in all, we give this product 4.8 stars. Parent Unit with Color 5.0" TFT-LCD, Desktop Kick Stand. 2-way Talk. Parent could sing or talk back to the camera unit. 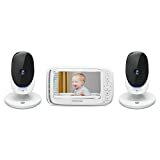 For parents with kiddos in separate rooms, this baby monitor system with two cameras is incredibly convenient. While many video monitors offer additional camera capabilities, this one comes ready to use with two. Plus, the massive video feedback monitor makes it easy to check on your little ones without disrupting their sleep. Parents enjoy the benefits of getting two decent cameras when you purchase this monitor. Plus, many people like that the screen lights up automatically when your baby cries. We like that this monitor is easy to use and includes two-way communication. Additionally, the batteries are rechargeable, and the parent unit is highly portable. While most parents love this monitor system, some reviews are less than favorable. The primary complaint is that the video quality is subpar. Additionally, some parents wish you could adjust the camera angles remotely. We still give this system 4.8 stars thanks to its impressive features and an additional camera. 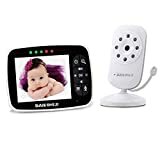 This Hello Baby wireless baby monitor brings another affordable video-enabled product to our top ten list. Like many other video monitors, this one can accommodate additional cameras and includes infrared night vision capabilities. This monitor also features two-way talk and contains eight different lullabies. We love the compact size of this monitor system and the variety of features it has. However, despite the large number of positive reviews, some users note that this monitor is cheaply made. On the bright side, many customers find this monitor remarkably easy to use. Plus, it stays connected better than some other models. When it comes to the world of baby monitors, this product is decidedly mid-range. It may not last as long as some other high-end models, but it provides an impressive array of features for an equally astonishing price. 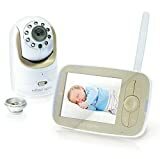 Parent love this baby monitor and we do too. It gets a solid 4.7 stars from us. Follow the user manual for a better understanding of use. For budget-minded parents that want a simple monitor setup, this VTech audio monitor is an excellent choice. Unlike older audio monitors, this product from VTech uses a digital signal to protect your privacy. It also features two-way communication and a backlit screen on the parent unit. The parent unit of this baby monitor system features a rechargeable battery that operates for up to 18 hours on a single charge. Additionally, the baby unit has a built-in night-light. Many parents enjoy the simplicity of the monitor system and the low price tag it carries. Plus, the belt clip on the parent unit makes it extremely portable. While reviews for this monitor system are overwhelmingly positive, some users have noticed issues with frequent disconnections. All in all, this monitor system is an excellent choice for people with small homes or parents that want an audio connection. We give it 4.7 stars. This impressive baby monitor from Summer Infant Baby is packed full of features. Like many video baby monitors, this unit has night vision and two-way communication. However, thanks to its impressive design, it also features better zoom, better night-vision, and better audio quality than many similar models. Parents love this baby monitor, and so do we. Unfortunately, some users report that the central unit doesn’t hold a charge well. Still, this is a high-quality baby monitor. We give it 4.7 stars. Many people enjoy the benefits of a monitor with video capability, but can’t afford the expensive price tags that come with them. While this monitor isn’t the least expensive on our list, its price tag is much smaller than many other video-capable monitors. Plus, this monitor system has several useful features to help you care for your baby. Unlike some video systems, this monitor does not require an internet connection. It is useful for many reasons, but one of our favorite features is that you can use it with multiple camera units. Additionally, it has two-way audio built in and features sound-activated LED lights. Caregivers enjoy this monitor because it is lightweight and extremely portable. It also has a temperature sensor, infrared LEDs, and includes an ECO mode to preserve battery power. Most parents love this system, but some note that it is not very durable. Some users also say it loses connection easily. We give this system 4.7 stars. Motorola is well-known in the tech industry for its high-quality products. And this monitor fits right in alongside their other wares. This monitor provides parents with peace of mind thanks to its two-way communication and infrared night vision. Plus, the display is large and portable making it great for use in a big home. Customer reviews for this product are positive overall. Parents love that this product provides high-quality video and audio. Plus, many parents like being able to communicate with their babies remotely. However, some customers have a few issues with it. Most notably, some parents don’t like that the backlight turns off after a while. It’s also worth noting that the customer support for this product is sub-par. Most users that experienced difficulty with the monitor also complained about the company. This is a good monitor, but don’t expect good customer support. We give it 4.6 stars. This portable baby monitor is like many other video options on the market today. It is in the mid-range concerning both price and functionality. However, many parents love that this product is relatively easy to use and affordable when compared to other top-of-the-line models. We like that this monitor can be used day or night without any trouble. Plus, it has two-way communication and doesn’t require an internet connection or smartphone. Unfortunately, some users note that the parent unit does not hold a charge well. We give this unit 4.6 stars. When shopping for the best baby monitor for you and your family, there are a few things to take into consideration. As we mentioned above, there are several different types of baby monitors available to consumers today. To begin, decide if you want just audio feedback or if you prefer a monitor that also includes video. Once you’ve decided whether or not you want video feedback, consider the following tips and tricks to find the best baby monitor for you. Keep in mind; the right baby monitor will make your life as a parent more manageable, not more nerve-racking. Consider how many receivers the monitor set includes vs. how many you need. Are there light indicators, or just sounds? Do you need a portable receiver? What kind of return policy does the monitor come with? Do you have any other digital devices that may cause interference with the monitor? Does the monitor offer any extra connectivity? Once you know what you’re looking for, picking out a monitor is simple. Remember to buy from a reputable seller and be aware of the monitor’s return window. Look for a monitor that comes with a good warranty. Also, if a monitor isn’t working for you, don’t be afraid to return it. Baby monitors can be temperamental and finding the right one takes time.